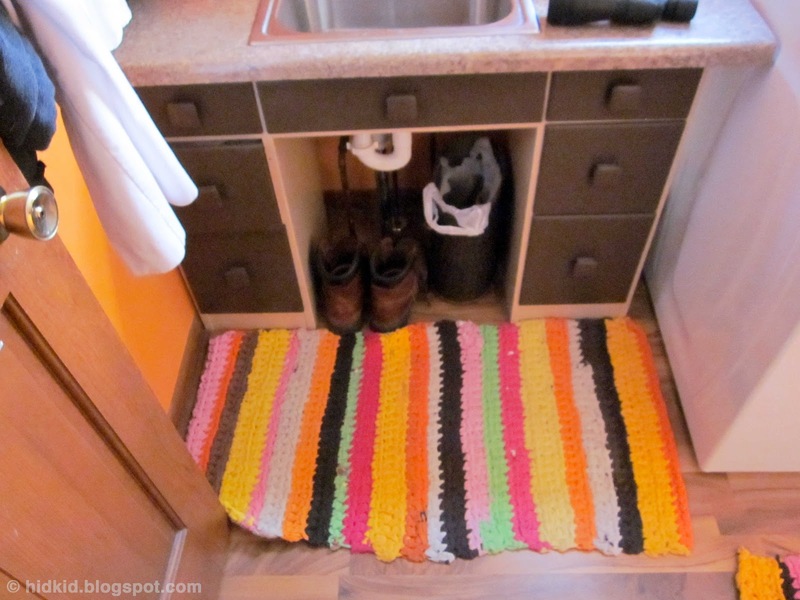 I made two rugs for my mom's laundry room out of old T-shirts. My parents recently remodeled their house and painted their laundry room a very happy orange. Mom loved the T-shirt rug my Aunt Nancy crocheted for her kitchen and asked me if I could make some for her. 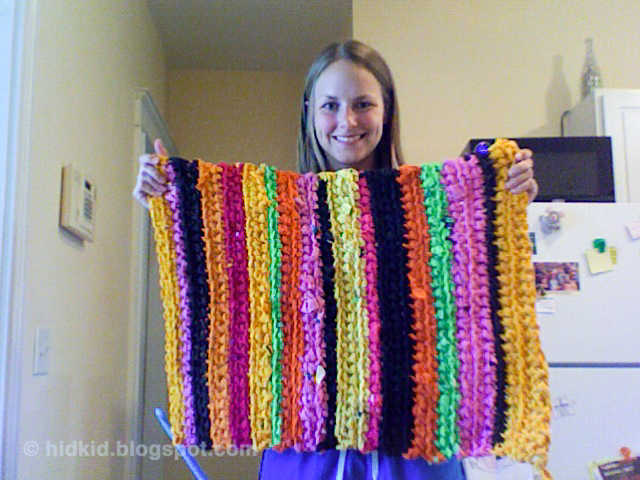 So Mom gathered tons of colorful shirts and cut them into the strips, and I got my Q-hook out and began crocheting. Cut T-shirts into ~1 inch continuous strips. I would always cut starting from the bottom and wind my way up until I got to the sleeves. I would cut the sleeves from the shirt and open up the shirt so that it is like a square with the neck hole in the middle. Then I cut around the neck hole, getting closer and closer until there was no more T-shirt to work with. Once you cut up the entire T-shirt, roll the "yarn" into a ball so it is easy to work with and move on to the next shirt. After you have a sufficient amount of T-shirts cut up, begin crocheting. 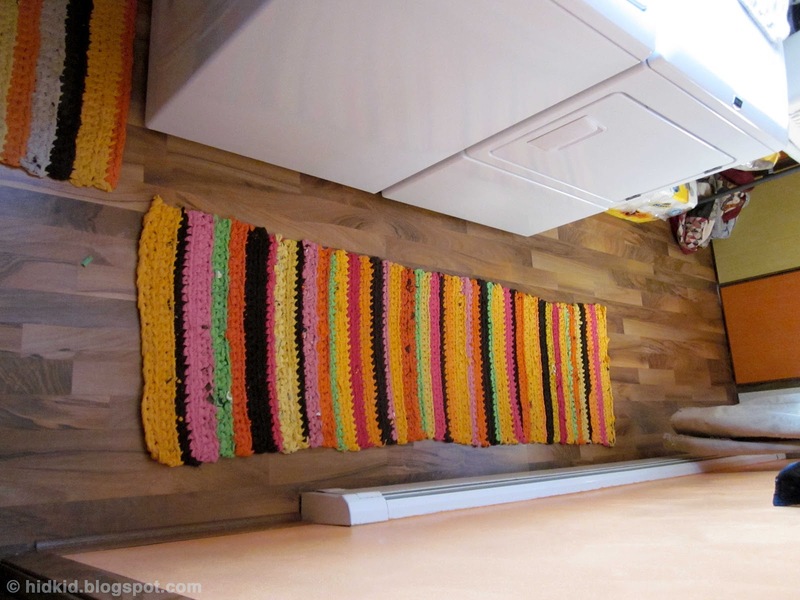 Using a Q-hook, chain as many as you would like and make your rug varying widths. The long rug is about 30 stitches wide and I cannot remember how many I did for the smaller rug. Continue single crocheting until the rug is the desired length. Switch colors by cutting the working color and sewing the end of the next color on securely with your needle and thread.